Surreal Trees 1: Robot 35: "Surreal Evolution Series” Medium: Graphite on paper (Bristol Board). Original Drawing Size: 18” high by 24” wide. Framed size: 22” high by 28” long (side-to-side width) by 1” wide (depth of frame). Year of completion: 2016. 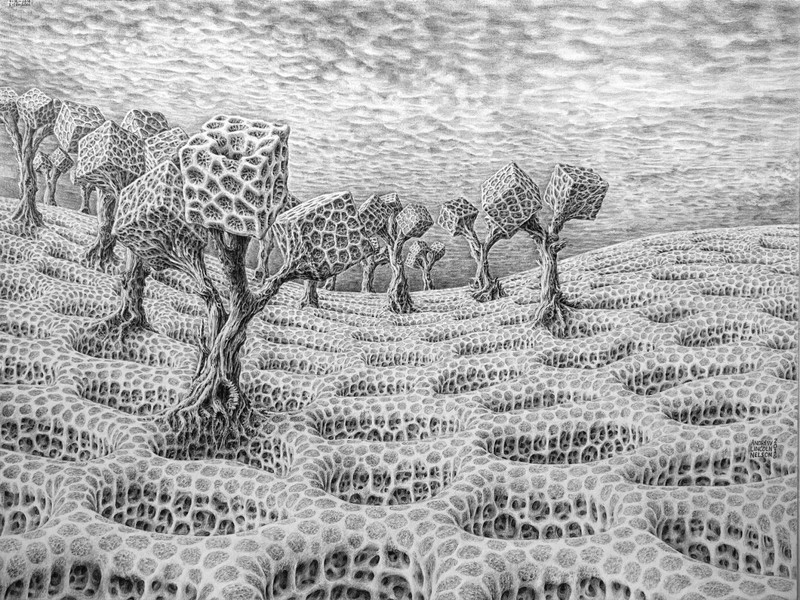 Description: These surreal block-trees in this picture are similar to the Phytoborgs in the Living Machines series of drawings. A “Phytoborg” is a vegetative lifeform that fuses machine and living plant-like elements. In this work though, the ground and sky are un-earthlike and perhaps on a microscale. This is the most surreal work of mine to date.